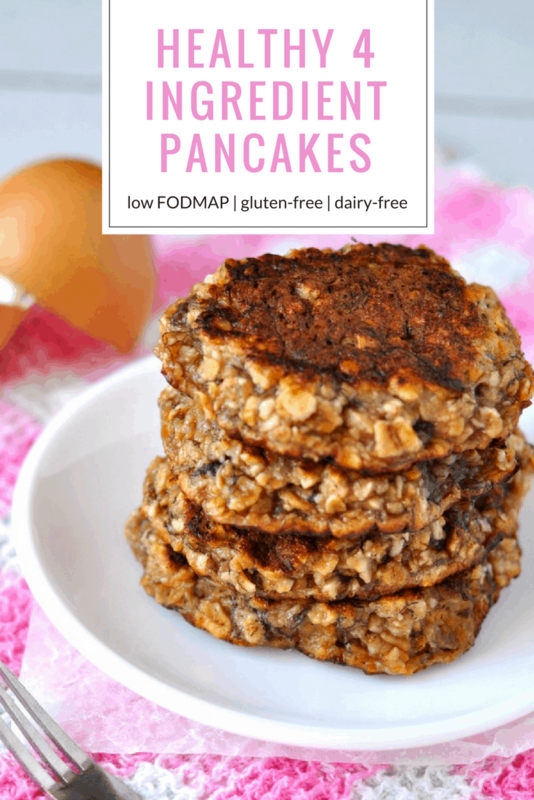 Get ready to throw your old pancake recipe away and embrace these life-changing 4 ingredient healthy banana egg pancakes! They come in at just 250 calories for a stack of 6 (yes, six!) mini pancakes and they’re entirely low FODMAP, gluten-free and dairy-free. They’re super fast to make, need only (you guessed it!) 4 ingredients and the best bit – they taste ah-maz-ing! Ever since I was diagnosed with IBS in November 2016, ordinary pancakes have pretty much been out of the question. All purpose flour and dairy milk just made pancakes impossible to enjoy. Even my 3 Ingredient Low Carb Pancakes were a big fat “no”. And a life without pancakes simply isn’t a life worth living, right? 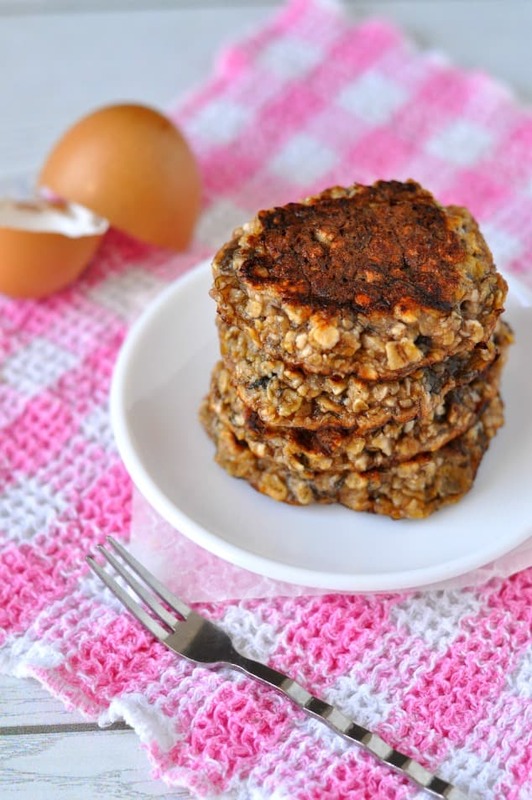 Which is why I came up with these low FODMAP banana egg pancakes. Pancakes for everyone! 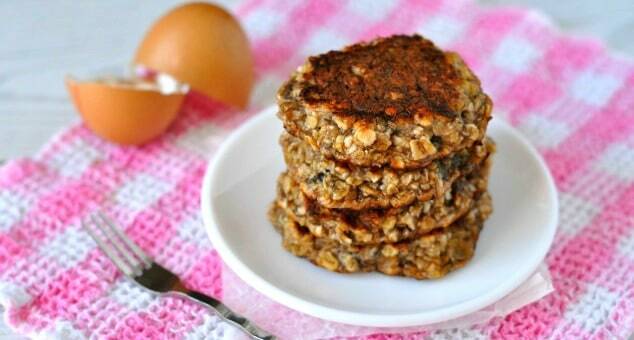 They’re based on the oh-so-famous 2 ingredient pancakes that requires only bananas and eggs. Personally, I don’t like that type of healthy pancake. I think they’re too eggy and taste more like a weird banana omelette. But each to their own, right? So I added in a scoop of gluten-free oats for some yummy chewy texture and a pinch of baking soda for extra fluffiness and the result was so much better than I could have ever imagined! These really are my new favourite pancakes of all time and I eat them at least once a week. You can pair them will all kinds of yummy toppings (Nutella, peanut butter, chocolate chips, strawberries, Greek yoghurt…) and they freeze really well, too. 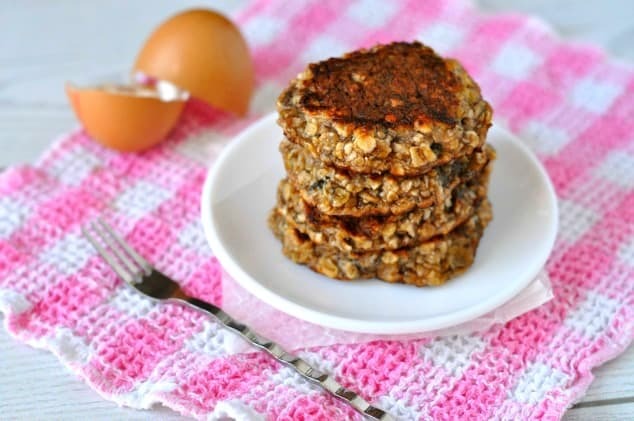 Make up a great big batch on the weekend and enjoy banana egg pancakes for breakfast all week! I’m currently staring at my screen trying my hardest to think of something fun and interesting to share with you. And I’ve got absolutely nothing. Summer has been super dull over here this year. There’s been absolutely nothing going on except heatwave after heatwave. But when September comes around, I’ll probably regret all the relaxing afternoons I wasted itching for something more productive to do. From football matches and local fiestas to friends visiting and friends staying, there’s a lot going on in September. I can’t wait for it to come! Place the banana into a medium-size bowl and mash it up as smoothly as you can with a fork. Mix in the egg, oats and baking powder until you've got a batter. Heat a small frying pan over a medium heat and lightly grease it with non-stick spray, cooking oil or butter. Scoop out 1/4 cup of the pancake batter and pour into the heated pan. Cook the pancake for 2 minutes on 1 side then flip over and cook for 1 minute on the other side. Repeat this step with the rest of the batter until it's all used up. Love that these treats are gluten free!! What a great idea adding oats to the mixture! Love it! I think it makes them a lot more filling! I’m with you on the egg-iness of the two ingredient version but these looks like they actually have a delicious texture to them! Glad to see I’m not the only one, Amy! They do have a much better texture with the oats. Nutrient dense! Definitely looks like a winner — and gluten free too! Thanks, Lisa. You should definitely give them a try! I am so going to have to try these. I feel the same way about the two-ingredient pancakes–waaaaay too eggy, so these sound perfect! I know! 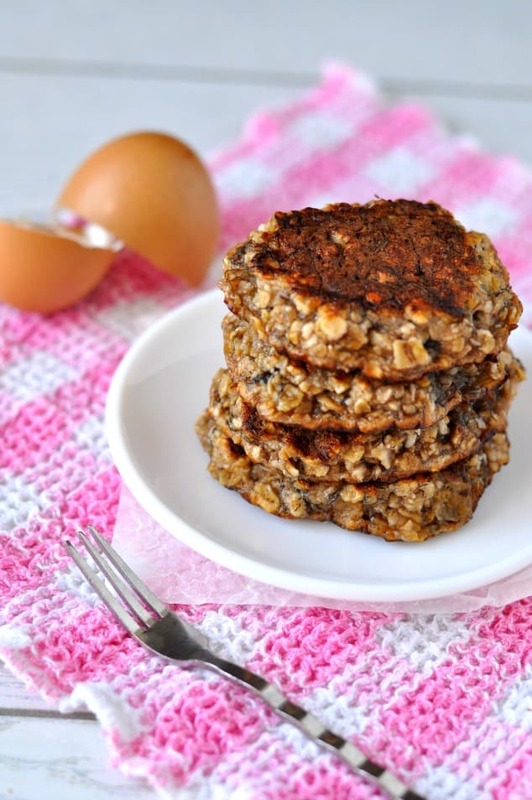 Definitely give the oat version a try – so much better!